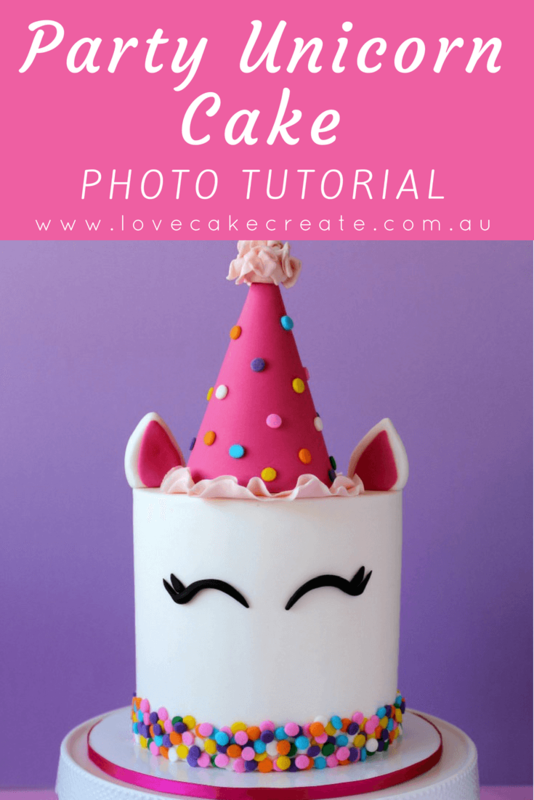 In this How to Make a Party Unicorn Cake Tutorial, you’ll learn how to create the ultimate unicorn cake! This colourful design will be a huge talking point at your next party. Have I got a fun tutorial for you today!! I wouldn’t blame you if you thought “Geez, not another unicorn cake!” Hasn’t the cake world been saturated with this design for long enough?! Nope, not just yet! There’s room for one more with this Party Unicorn Cake. I haven’t seen a unicorn cake quite like this before – with a frilly, confetti covered party hat made out of fondant. Most cakes feature a large gold horn and buttercream swirls cascading down the mane. I wanted to create something different, playful and eye catching. It had to be easy too – I want all levels of decorators to feel confident giving this a go. I was umm-ing and ah-ing whether I should create a horn, but the party hat kind of acts as the horn, so there’s no need to make one to go under the hat. The colourful edible confetti around the bottom of the cake and on the hat help tie everything together. With all the elements combined, this unicorn is ready to PARTY!! Give yourself a day or two for the party hat to dry completely (perhaps a little longer if it’s humid). I used Bakels Pettinice fondant for this cake and it dries really well, especially with tylose added to it. 1 x 5″ round x 5″ high cake covered in white fondant (or the size of your choice). Since the party hat will need a day or so to dry, we’ll start with that first. 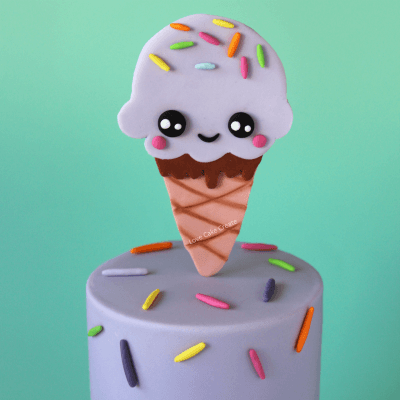 The party hat on this 5″ round cake is approximately 9.5cm high x 8cm at the widest point (around the bottom). You can use your own template, or use the one provided. 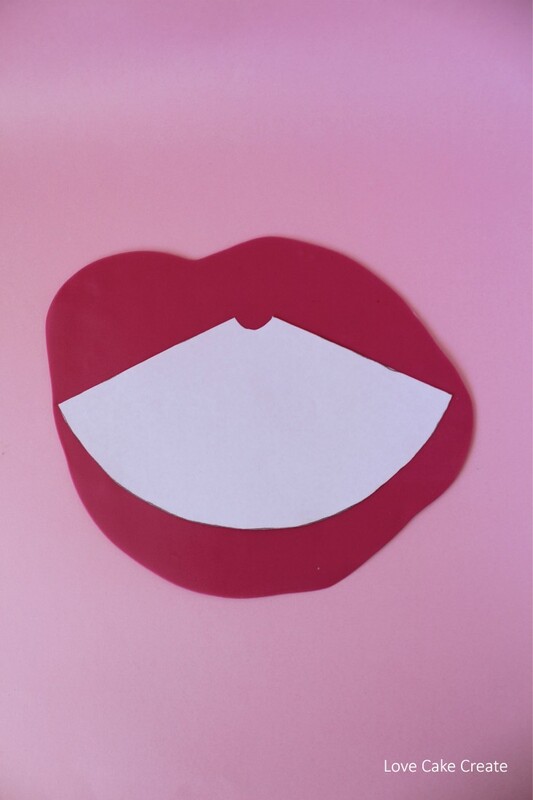 Cut out 2 party hat templates. With the first template fold it into a cone shape and secure in place with sticky tape. Brush a little cornflour around the outside to prevent the fondant from sticking to it. Take the dark pink fondant and press it into the tylose/cmc powder. Mix in the powder that sticks to it. Press it into the powder once again and mix it in well. Adding tylose/cmc powder to the fondant will ensure the hat dries quickly and firmly. 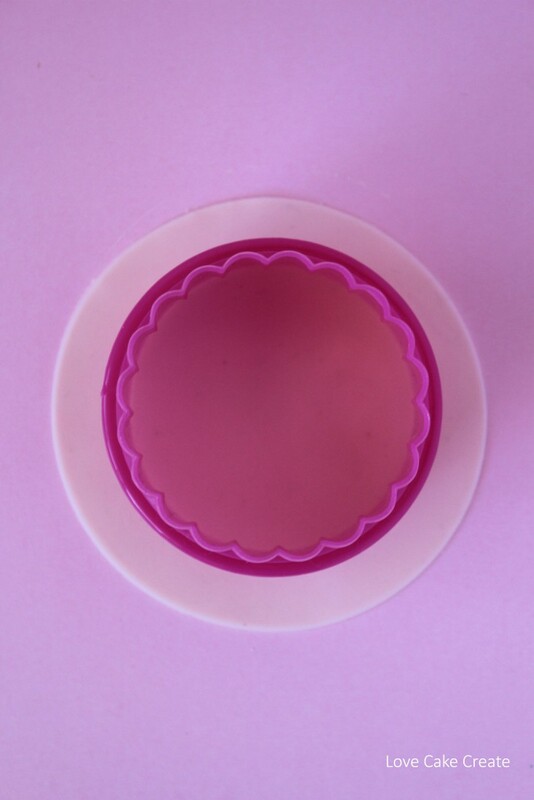 Roll out the dark pink fondant to approximately 3mm thickness. Take the second template, place it on top of the fondant and use the sharp knife to carefully cut around it. 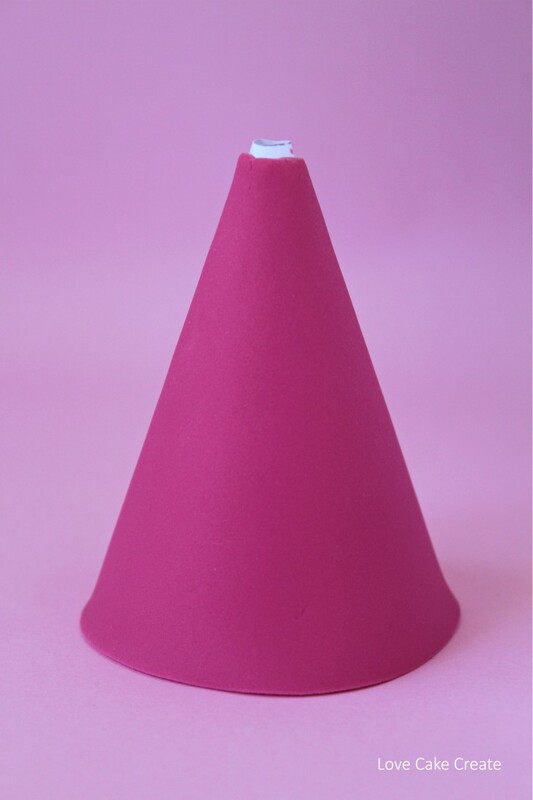 Pick up the fondant and mould it around the cone shape you created and secure it at the back with edible sugar glue. 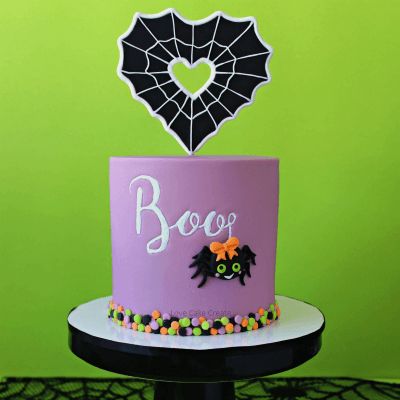 Take a second to ensure the fondant is smooth and sits neatly around the bottom. Pop the hat aside to dry. Take the pale pink fondant, press it into the tylose/cmc powder and mix it in well. Repeat that once more. 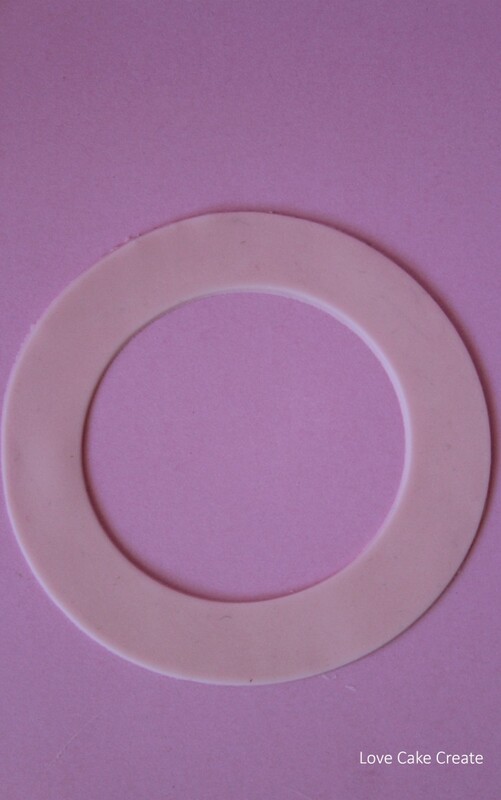 Roll out the pale pink fondant very thin and cut out 1 x 8cm circle. Using the picture below as a guide, place the 6cm cutter over the circle you just cut – ensure there’s even spacing all around. Use the sharp knife to make a cut across the circle as shown below. Place the frilling tool (or the balling tool) on the outside edge of the circle and using firm pressure, roll the tool around the circle with your fingers. 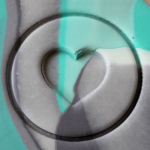 As the tool moves around the circle, the edge will become thin and start to ruffle up. Once you get to the end, use the sharp knife to trim off the very ends so they’re neat. Use a dab of sugar glue to secure the ends together. Repeat the process to make a second ruffle-y circle. 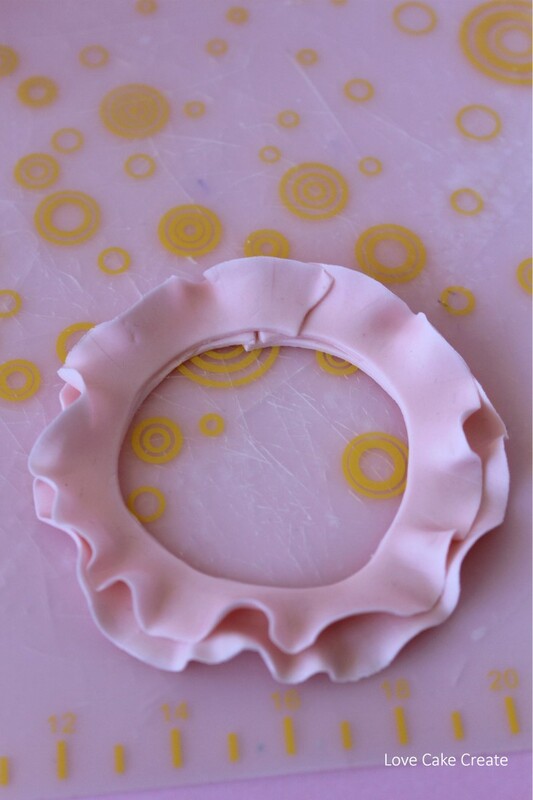 To secure one on top of the other, brush a light layer of sugar glue around the inside circle and place the other ruffle-y circle on top. 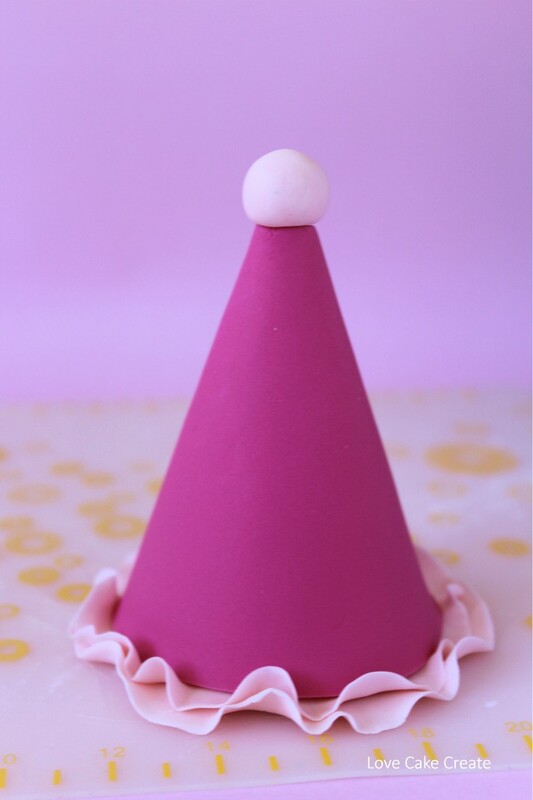 Use your fingers to adjust the ruffles so they sit nicely and then take your fondant hat in the shape of the cone and ensure it fits well on top of the ruffles. Leave the ruffles to dry while we create the rest of the hat. Roll a small ball of pale pink fondant with added tylose/cmc powder. Remember that the ruffles will add extra height and width so you don’t need the ball too big. Pop it on top of the fondant cone to ensure it’s the right size. 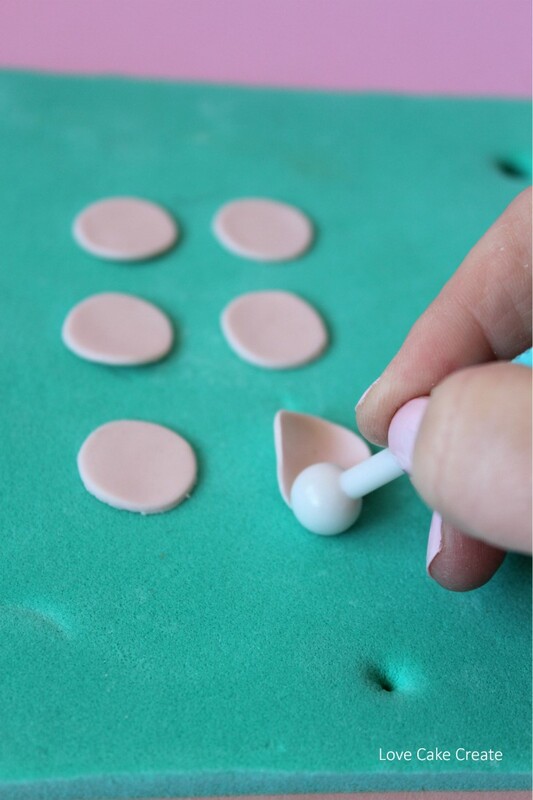 Gently press the ball into the top of the fondant party hat which will ensure the ball moulds to the top and sits snugly on the hat. Pop the ball aside while you make the ruffles. Roll out the pale pink fondant very thin. 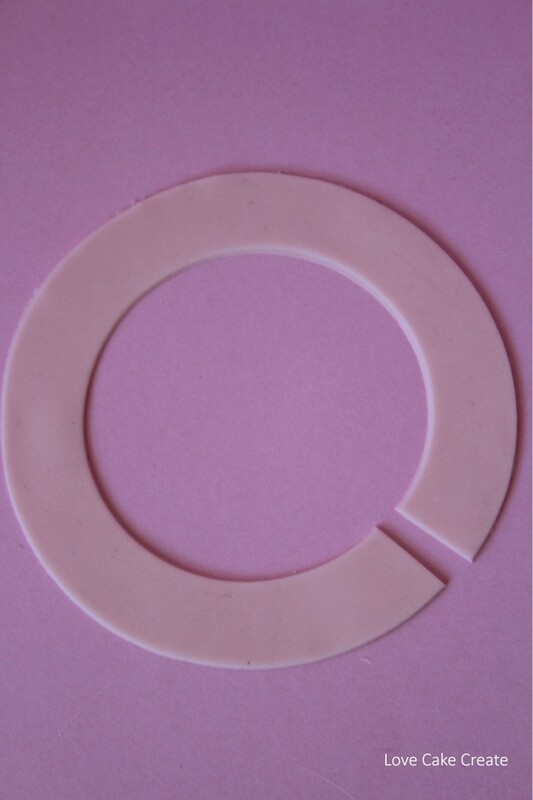 Cut out a few circles using the 2cm circle cutter and place them on the foam pad. 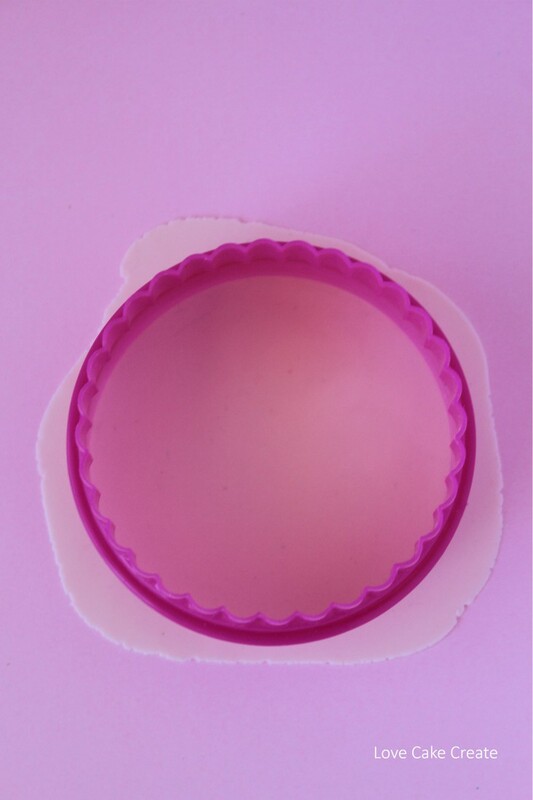 Using the balling tool half on and half off the edge of the circle, apply a firm pressure and move around the rim of the circle. This will thin around the edge and give it a slight wave. 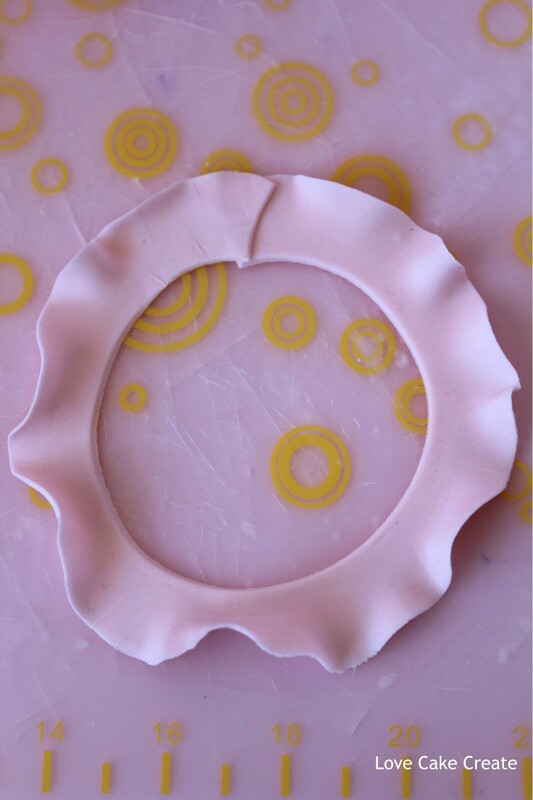 Brush a little sugar glue in the middle of the circle and scrunch it up – position the frilled edges up towards the top. Use the sharp knife to remove a small section from the back which will help it sit flat on the ball. To secure the ruffles to the ball, add a little sugar glue to the back. Continue making the scrunch ruffles until the entire ball of fondant is covered. Once the dark pink cone has had ample drying time, it’s time to start putting it all together. 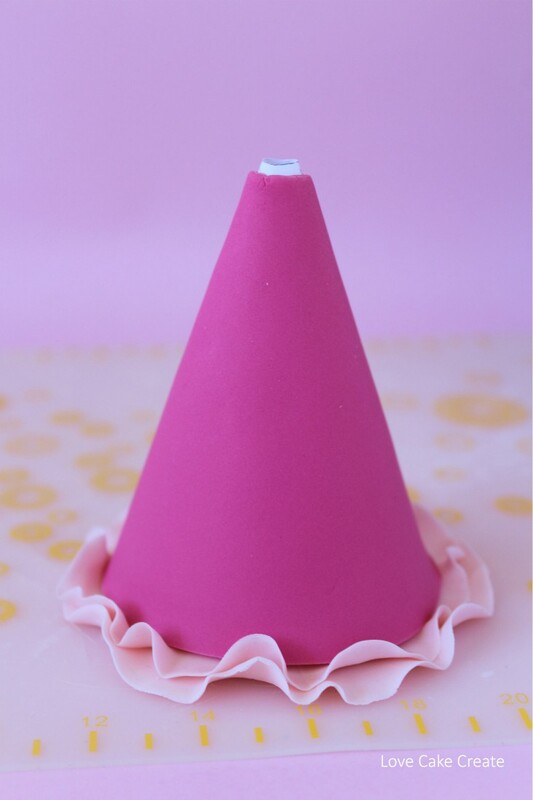 Remove the paper/cardboard cone from under the fondant and brush a little piping gel around the bottom rim of the party hat. 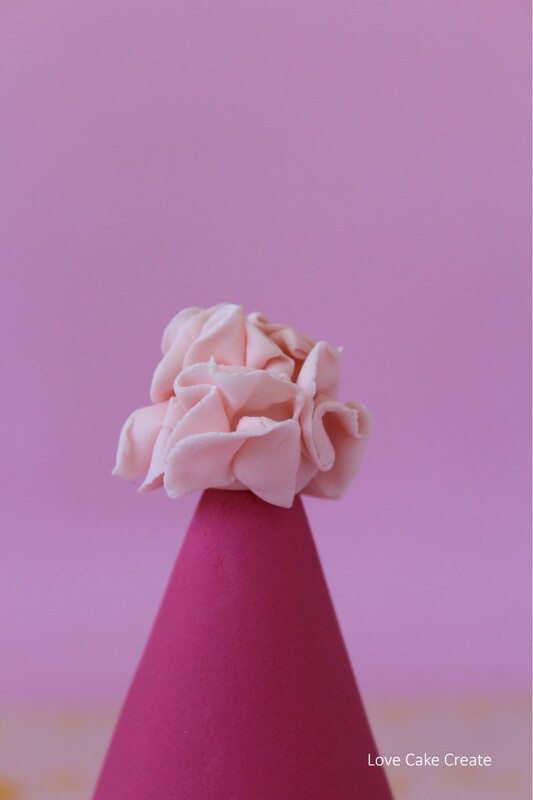 Secure the cone to the pale pink ruffles. 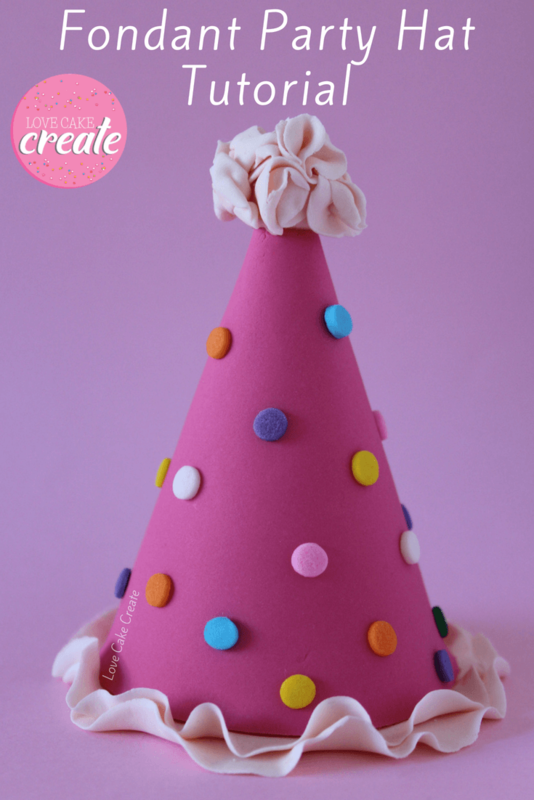 Apply piping gel underneath the pom pom ball and hold it in place on top of the party hat until it’s secure. 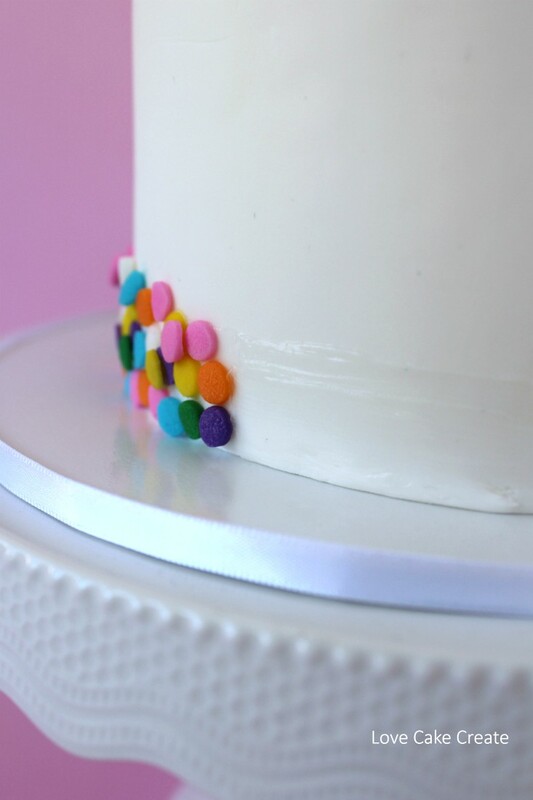 Add a little piping gel to the back of the edible confetti and start dotting them all over the party hat. 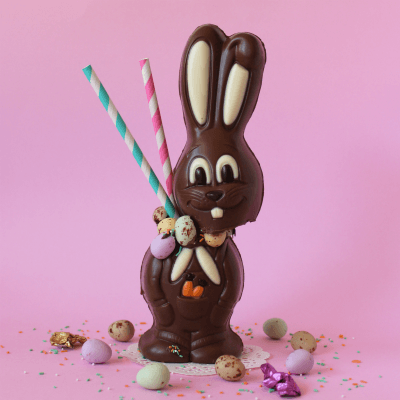 And that’s the party hat complete – looks pretty cute, don’t you think?! 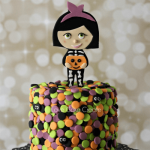 Pop it aside while we work on the rest of the cake design. Push some white fondant into the tylose/cmc powder and mix it in well. 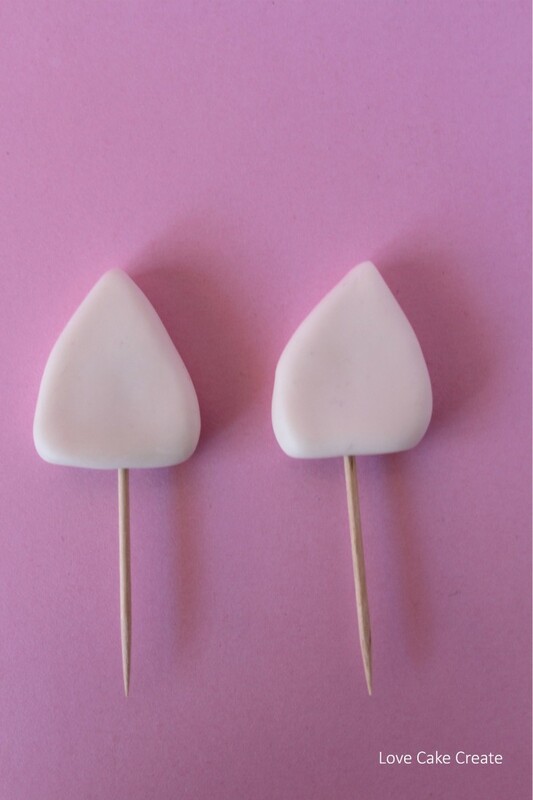 Use your fingers to mould the fondant into a rough triangle shape. Repeat that once more so you have two ears – hold off on inserting your toothpicks just yet. 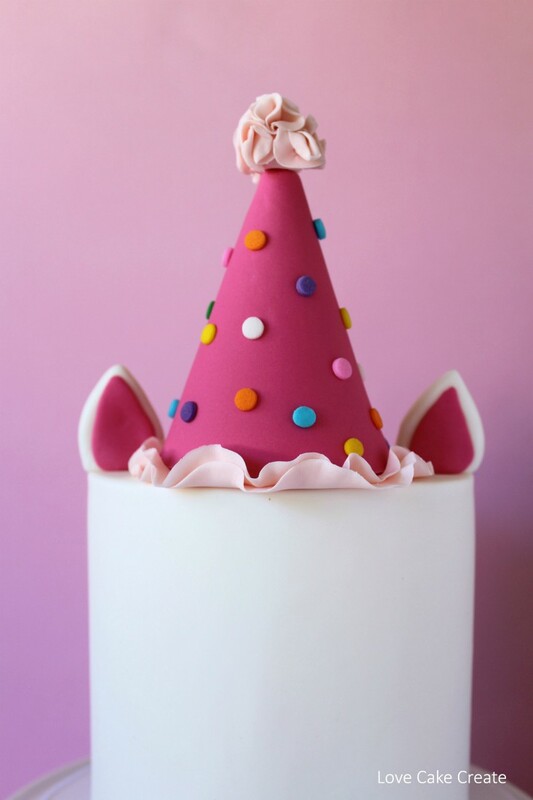 Pop the party hat on top of the cake (if you haven’t baked the cake yet, just use an up-turned cake tin in the same size that you’ll be baking) and position the ears on each side of the hat. We’re just checking that the ears are the right size and not too big to fit on either side of the hat. If they are too big, just re-make them smaller. Once you’re happy, insert a toothpick into the bottom of each triangle; that will make it easy to attach the ears to the cake. 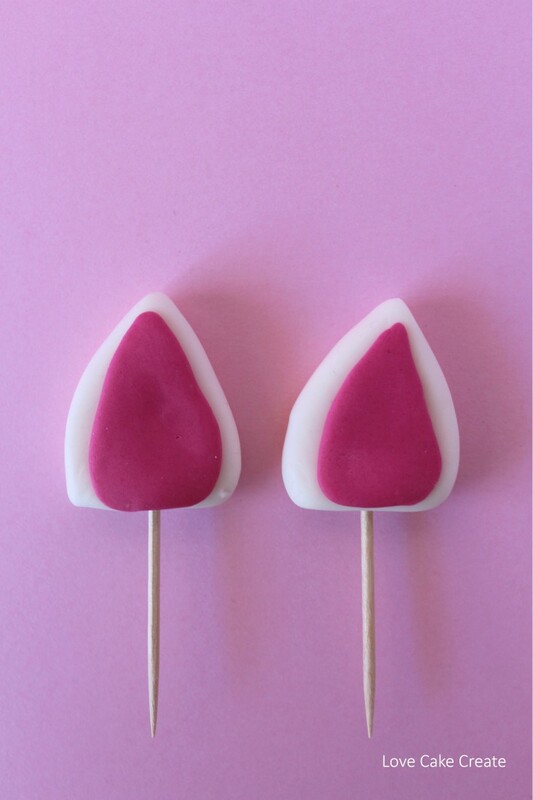 Take a little of the dark pink fondant, roll it out quite thin and use the sharp knife to cut out a triangle shape – it needs to fit inside the white ears you just made so refer to those for the size. Use your fingers to smooth the cut edges. 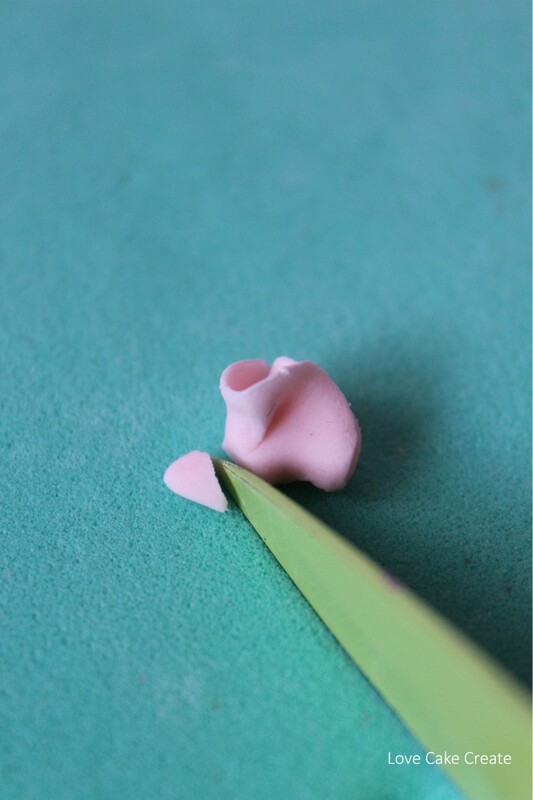 Apply sugar glue to the back of the dark pink ears and attach it the the front of the white ears as shown. Roll the black fondant in some tylose and mix it in well. Create a thin sausage and taper each end into a point. Position it into an arc shape and flick out the outside edges of the eyes. 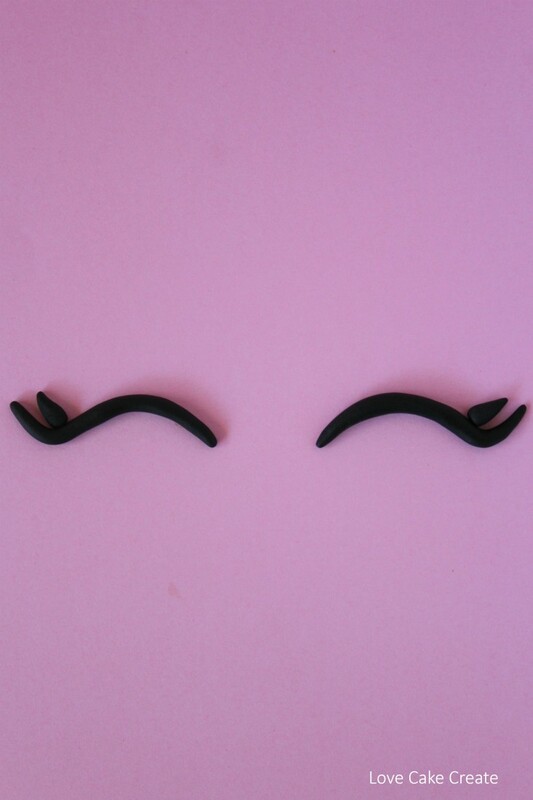 Roll a tiny eyelash which will go on the outer edge of the eye. Repeat the process for the second eye. Allow them to dry for about half an hour, so when you pick them up they will still hold their shape. To attach the eyes to the cake, first work out where you would like them positioned. Hold the eyes up to the cake and once you’re happy with the placement apply a tiny amount of sugar glue to the back of the eyes and hold them on the cake until they’re secure. 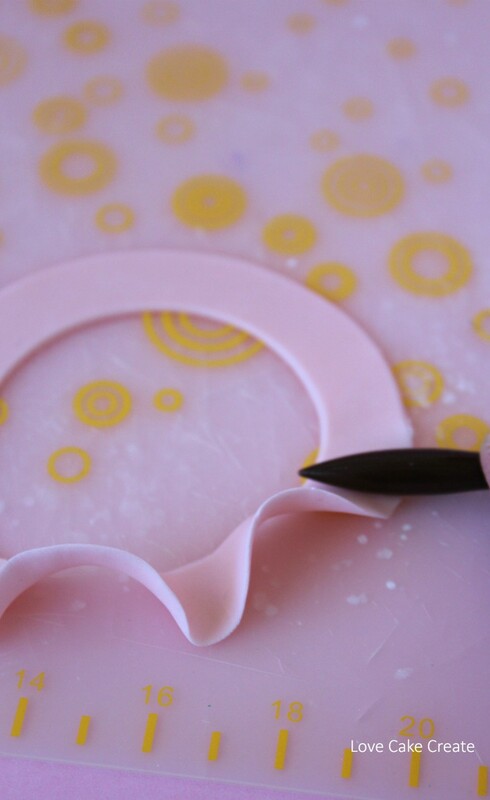 Working in sections, brush a light layer of piping gel around the bottom of the cake. 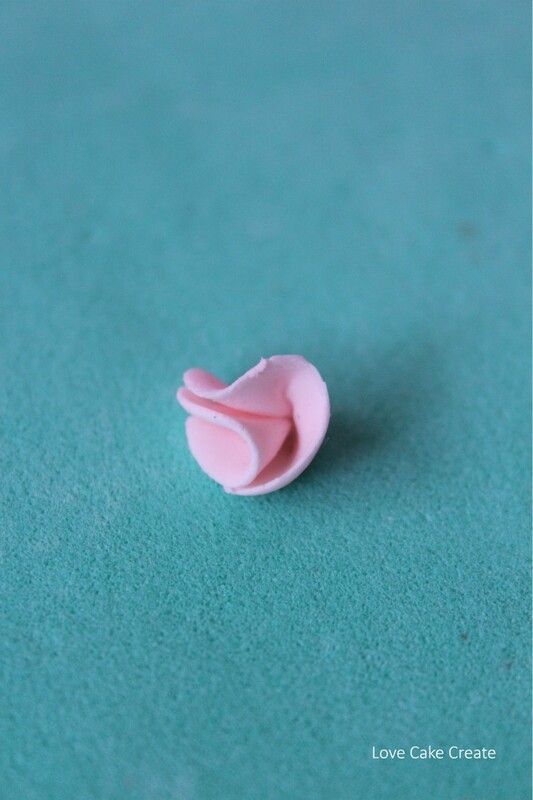 Take small handfuls of edible confetti and press it into the piping gel. Make your way around the cake, adding piping gel and confetti until you’re back at the start. If there are any gaps where the cake is peeking though the confetti, just add some piping gel on the back of the individual confetti pieces and apply them to the cake. And that’s it! Now your fun and colourful party unicorn cake is ready to join the celebration!! 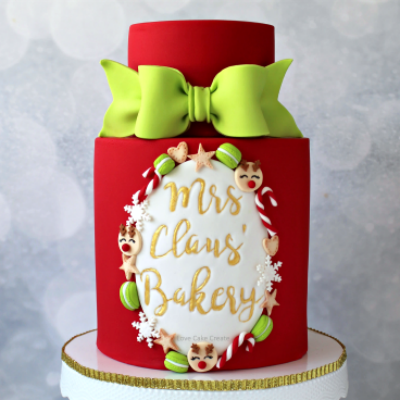 I hope you enjoy making this cake as much as I enjoyed creating the tutorial! If you do create this cake, I’d love to see. Feel free to tag me on Instagram @love.cake.create or share it on my Facebook page so I can check it out. 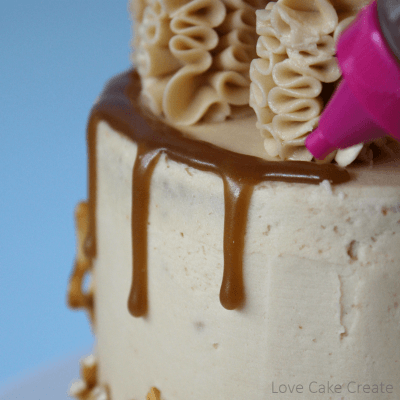 Do you need an awesome mud cake recipe that tastes amazing and holds up well under fondant? Then head over to my Dark Chocolate Mud Cake post – I love that recipe! 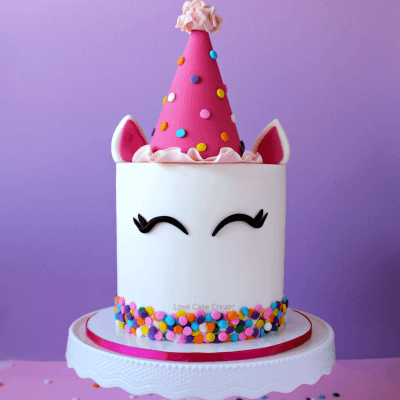 If you loved this Party Unicorn Cake Tutorial, don’t forget to PIN it! Wow! This looks incredible! You’ve inspired me this morning to get off my tail and start planning to make a cake for my sons birthday. I love the edible confetti! I am going with the PJ masks team, I am definitely going to sneak in sprinkles somewhere. Love it! Thanks for sharing. This is SO CUTE! You are insanely talented! What a fun idea! That cake is so cute! Thanks Molly, I had a lot of fun designing and making this one! How very very cute! There are a lot of these around, and this one stands out as completely charming. It came out so good. You are talented. Thanks Tanvi, it was much easier to make than it looks! Wow! You are so talented. I am not a baker but if I were I would totally use this. Much appreciated Lee, glad you like it! Omg this is PERFECT!! 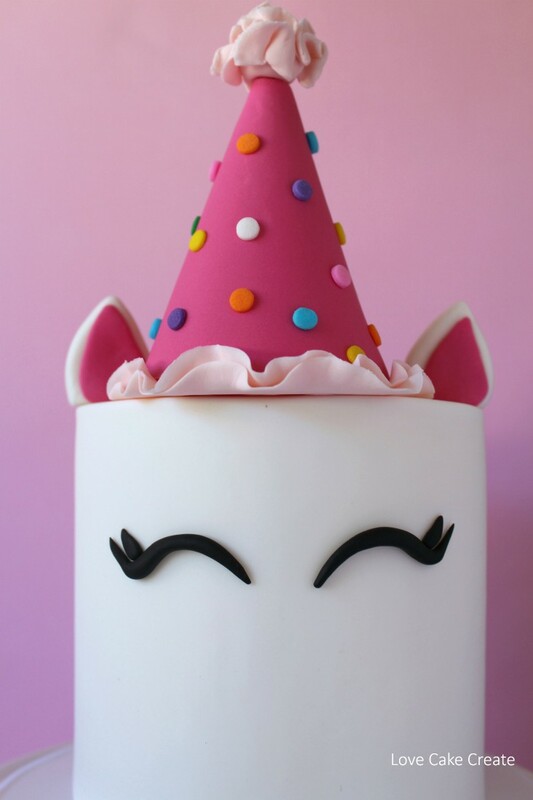 I’m planning on making my daughter a unicorn cake for her bday party next weekend and I had no idea where to start! Thanks for sharing this! Fantastic Bethaly, I’m so pleased you like it! I hope you found the tutorial helpful, best of luck with your upcoming cake – I’m sure it will be amazing! Thanks Kayleigh, I had such a fun time making it! Wow! 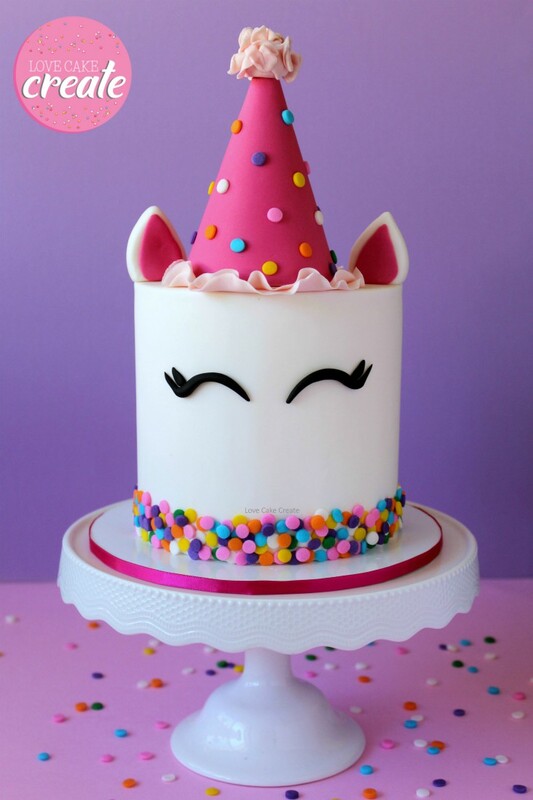 This is such a cute unicorn cake! Thanks T’onna, I loved creating this one! I’ve always wondered how those are done! SUPER CUTE!! What a great tutorial. The detail will make it so much easier to recreate than just a picture and explanation. Thank you for this! This is such an awesome tutorial! Looks so easy when broken down step by step! This is so adorable! Definitely pinning for later! Ah I really appreciate that Katie, thank you!! This is so cute!! I’m not much of a baker l, but I just might take a stab at this! This is so stinking cute! You have such talent! Ah thanks Tiffany, it’s not as difficult as it might look! Thanks Patricia, I hope you had a fantastic birthday! Thanks Rebecca, I loved making it! This is such a fun looking cake. I absolutely love the edible confetti. Your tutorial is very thorough too. 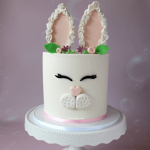 I haven’t worked with fondant yet, but it’s on my list of new skills to try! Can’t wait to try to make this, thank you for this helpful blog! Thanks so much for your lovely comment Penelope!